Despite her gruff exterior and intimidating presence, the emperor scorpion can make quite a lovely pet. They are relatively easy to care for and require little in the way of food and space. Because gestation in Emperors takes 10 to 14 months, it's common to accidentally end up with a pregnant female. If your new pet has just had a litter of babies, ensuring their safety and health should be your No. 1 priority. Prepare a separate enclosure for the new scorpions. You’ll need a small water dish, a source of heat, some substrate and a few bits of bark or some rocks for them to explore. Scorpion babies have the same environmental requirements as their mothers. Allow the mother scorpion to rear her young for the first one to two weeks. The babies will stay on her back and she will do everything needed to keep them fed and safe. Watch for the scorpions to leave their mother’s back. Separate them when this occurs and give her a nice big meal. If the young are left in the same tank, the mother may eat them. 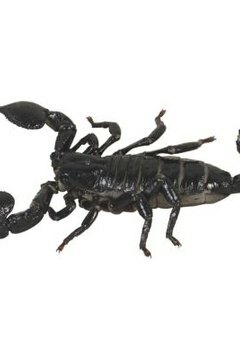 Keep the young scorpions in an enclosure together and feed them one or two small crickets each per week. They can be placed back in the tank with their mother once she has begun feeding again and they large enough to avoid becoming a snack; mother scorpions only eat their babies out of stress or extreme hunger associated with pregnancy.  Stressing the mother out by modifying her surroundings or attempting to interact with her may make her more likely to eat her young.  Emperor scorpions can birth between 10 and 35 babies at once.  Baby scorpions go through around seven molts before becoming sexually mature, which takes several years.